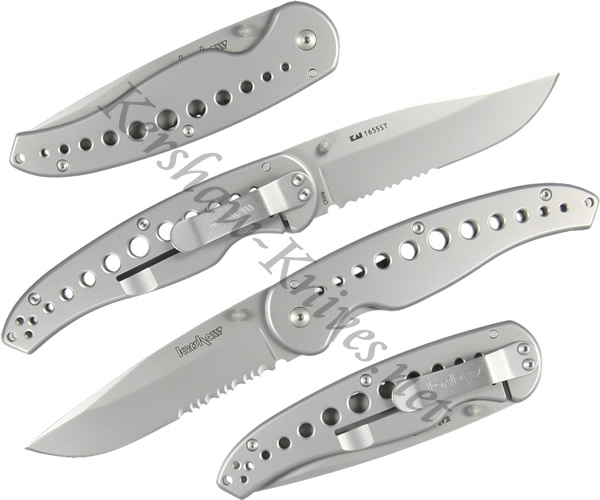 The all steel construction of the Kershaw Vapor III serrated knife model 1655ST features an 8CR13MoV blade mounted on a stainless steel handle. Dual thumb studs allow ambidextrous use of the knife. The blade locks into place with a frame lock mechanism. The bead blasted finish and drilled, contour handle of the Vapor III give it a modern stylish appearance. The Kershaw Vapor III is carried using the included pocket clip.